Hello everyone, Jeanin here with the second card I made as a Guest Designer for Gerda Steiner Designs. There are a lot of tutorials out there on how to create the basic shape of this card, so I won't go into detail here. What's important is that the box includes two flaps in the inside to which you can adhere all your images to. I also included white panels to the inside of the card. The panels where slightly smaller than the flaps. 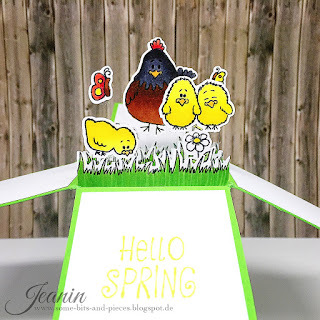 On the front panel I stamped the sentiment "Hello Spring" in a lime green color which matched perfectly with the patterned paper panels on the outside of the card. Again, thank you so much for having me. It was so much fun to create these projects with this fun and adorable stamp set! Hello crafty friends! 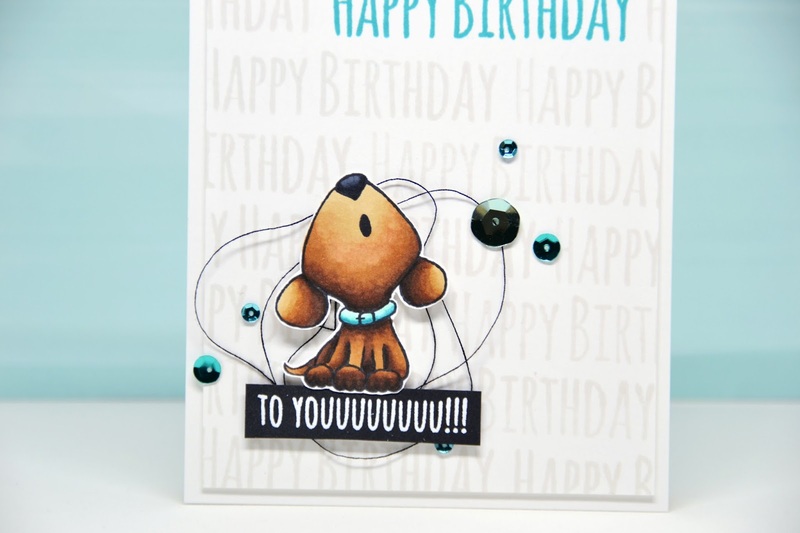 It's Jess from JessCrafts.com and today I'm sharing a bright fun card with the new Gopher It clear stamp set. I love coffee and so I really enjoyed this punny little saying. I decided to stamp the word coffee repeatedly to create a bright background. For more on this card check out my video. 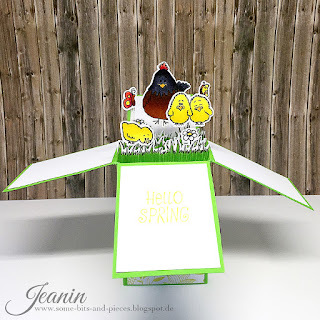 Hello there, Michelle here and I am back with my second Guest Design post for Gerda Steiner Designs. 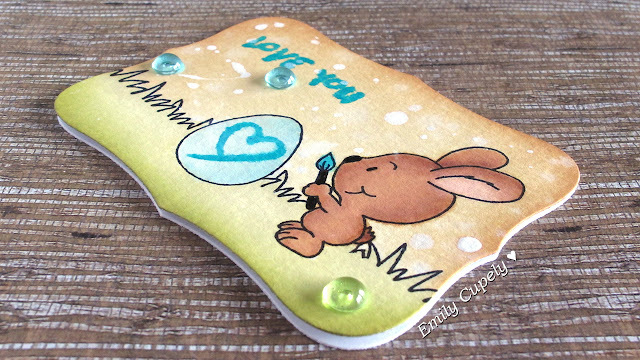 Today I am combining the Happy Hoppy and Brush Bunny sets for an Easter card. 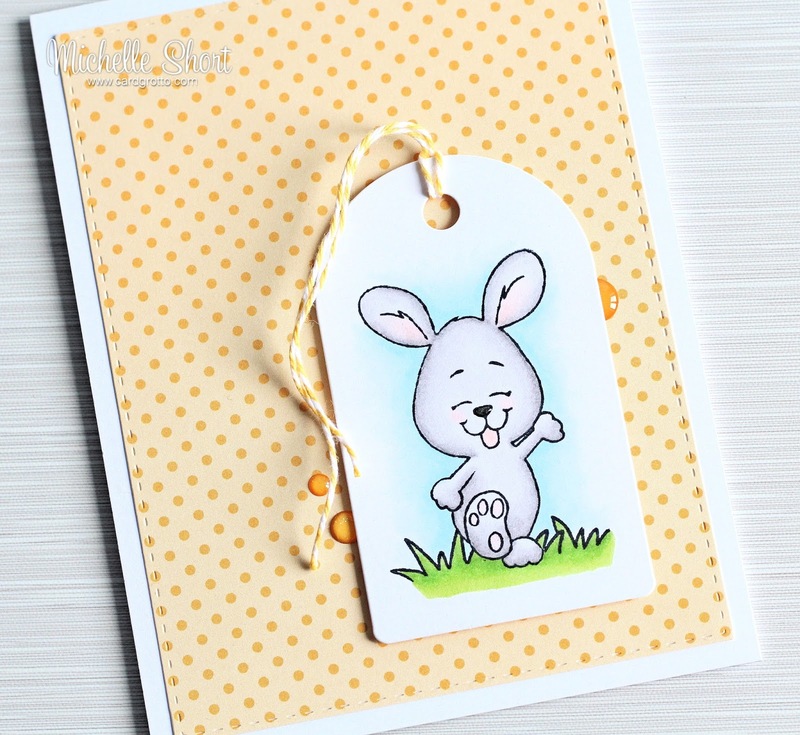 I started off by taking die cut tag and stamping the bunny from the Happy Hoppy set on to it. I then masked him off (using mask paper) and stamped the grass. These were then coloured in using Copic Markers. I took a white A2 card base and added a layer of yellow patterned paper to it and then added the bunny tag with foam tape on top. I also added some twine through the top of the tag and some enamel dots for more interest. For the inside of the card, I took a grass die and cut this from patterned paper twice. These were added to the bottom of a panel of cardstock. 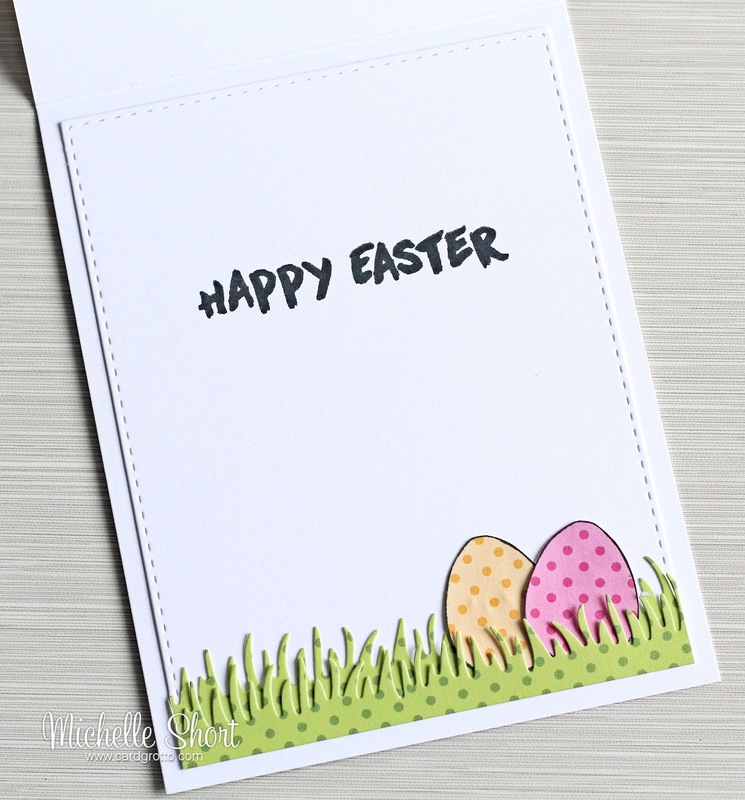 I then stamped the Easter egg from the Brush Bunny set twice; once on to yellow paper and then on to pink paper. These were cut out and then popped in to the grass. 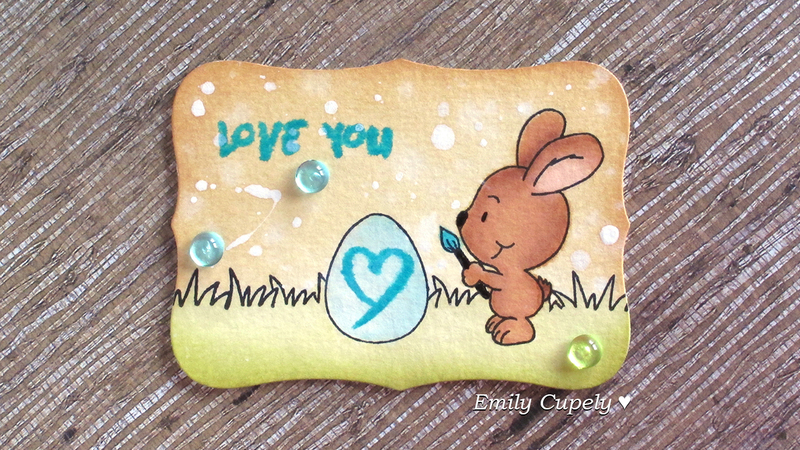 To finish off, I stamped the sentiment, also from the Brush Bunny set, using black ink. The panel was then adhered to the inside of the card. A big thank you goes to Gerda Steiner Designs and the DT for having me Guest Design with them. Thank you so much for visiting today, I hope you have a great day! Next time I will show you another cute birthday card. 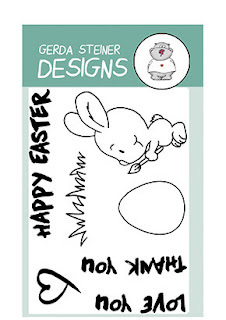 Hello, Jeanin here and I am super excited to be Guest Designing for Gerda Steiner Designs today. 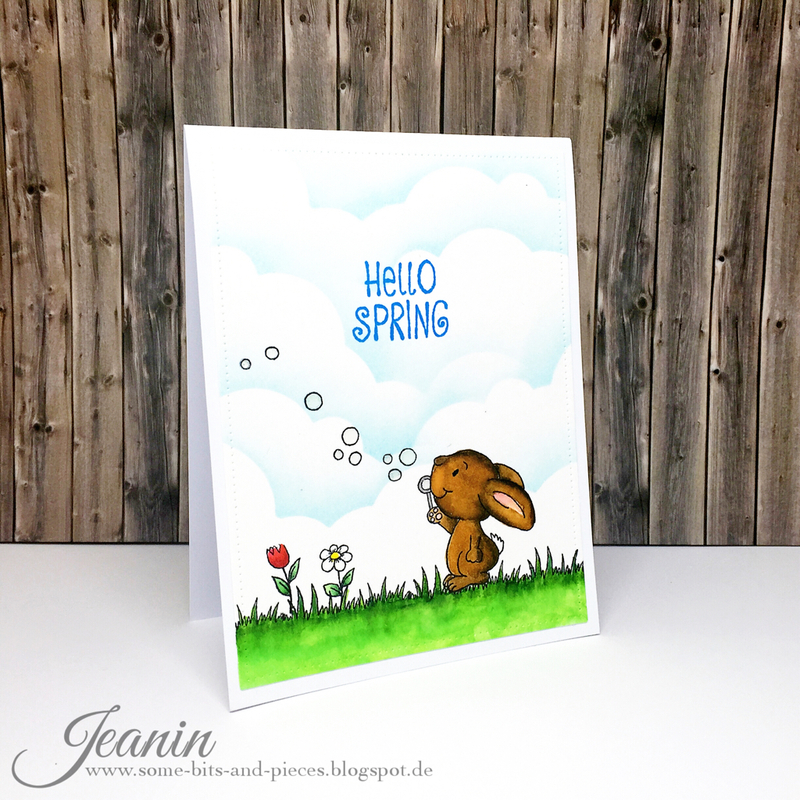 I have a card to share using the adorable Happy Spring Set. 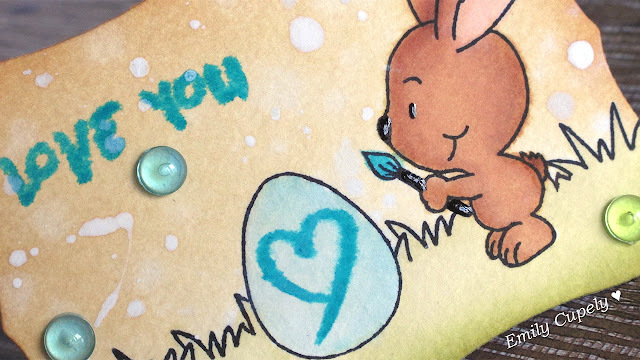 I started off by stamping the little bunny using black waterproof ink on some white cardstock. I also created a mask for the bunny because I wanted to stamp the grass stamp along the bottom of the card behind the bunny. For the background I used a self-made stencil to create some fluffy clouds. I placed the stencil on my cardstock and applied a light blue ink with a blending tool along the edge of the stencil. 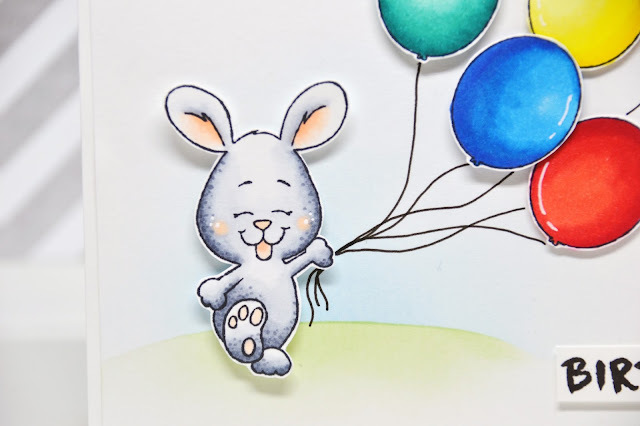 To give the scene a little bit more detail I also stamped two of the flower stamps along the grass and wanted to let the bunny blow some soap bubbles, which I stamped across the cloudy background. I colored in the images with Zig Clean Color Real Brush markers and added the sentiment "Hello Spring" in the top center of the card using blue ink. 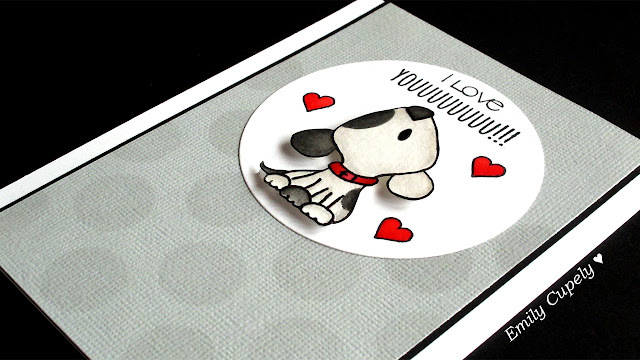 To finish off my card I die cut my panel with a stitched rectangle die and adhered it to a top-folding white notecard. I also applied a bit of Glossy Accents to the soap bubbles. I really, really love this set. It includes so many fun images to build a variety of scenes. Hey everyone! 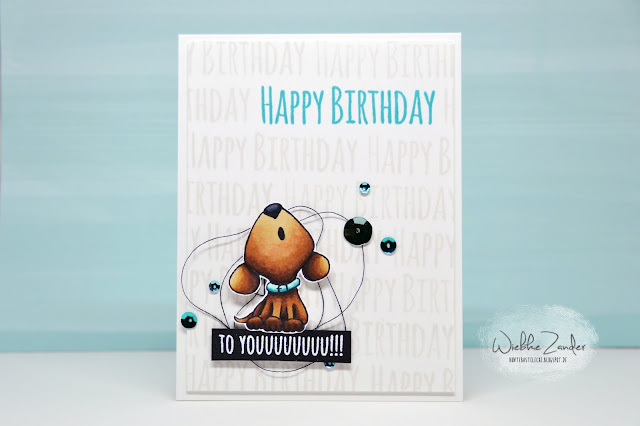 It's Wiebke here and I have two cards for you today! 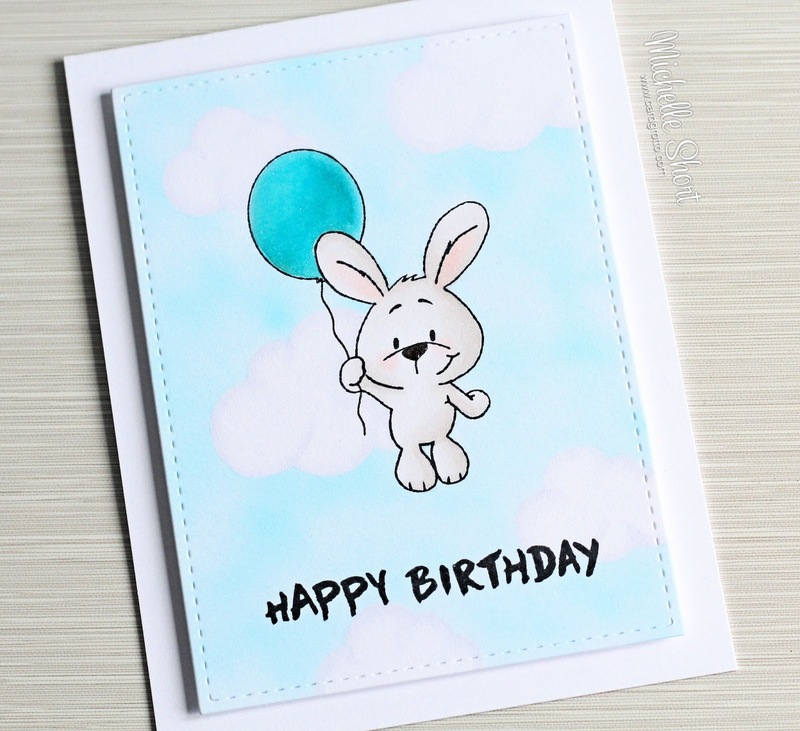 For my bunny card, I stamped out and colored the bunny plus a few balloons. I cut out a small hill mask and used a green and a soft blue Distress Ink color to create a grass hill with a soft touch of a sky. 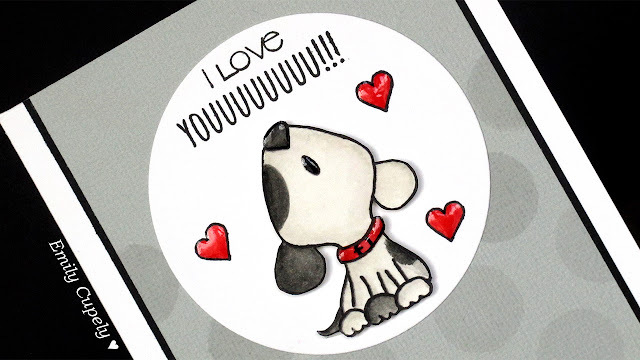 Just mask off one side and sponge with the color over it to get that look, afterwards mask off the other side and do the same with the other color ;) Then I stamped two different parts of sentiment stamps on white cardstock, cut them out and placed them on my card. I think different fonts always add much more interest to a card! Then I took a black fineliner to draw the string of the balloons to the hand of the bunny. This card was quite an easy one! I saw a very similar card on Pinterest the other day and just HAD to create something in that direction. 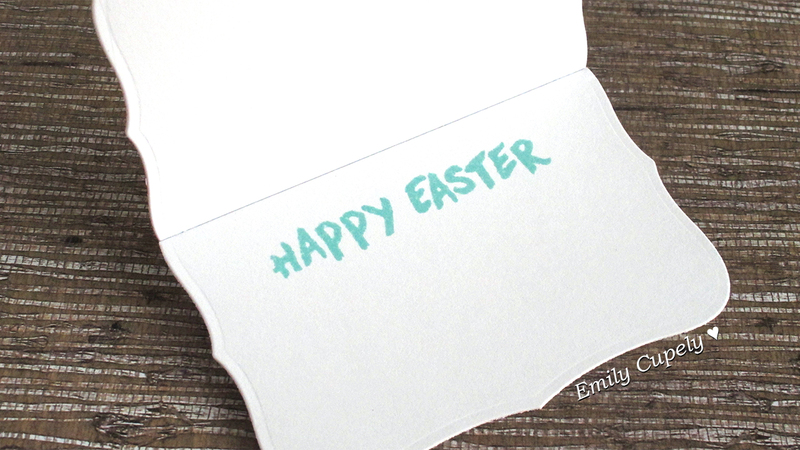 I just stamped the sentiment with five different Distress Ink colors on a piece watercolor cardstock. But before you stamp them on it, you need to spray a bit of water on the inked stamp. You'll get a more even look and it looks a bit more.. "messy" and "blurred". 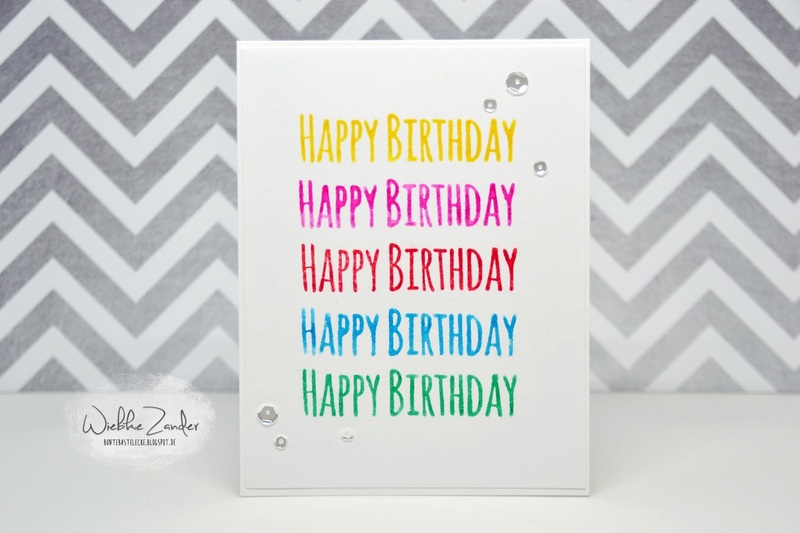 Always start stamping in the middle of your card (the red one here) - that way, you'll get a perfectly centered image! I hope you're a bit inspired now! :) Have a great day! Hello there, Michelle here and I have the absolute pleasure of Guest Designing for Gerda Steiner Designs today. 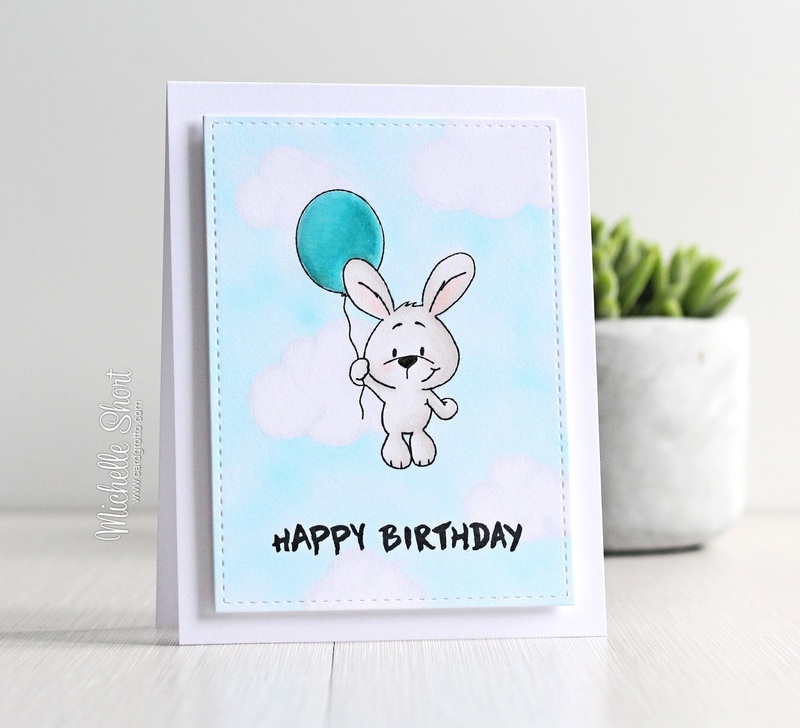 I have a card to share using the super cute Happy Hoppy set. 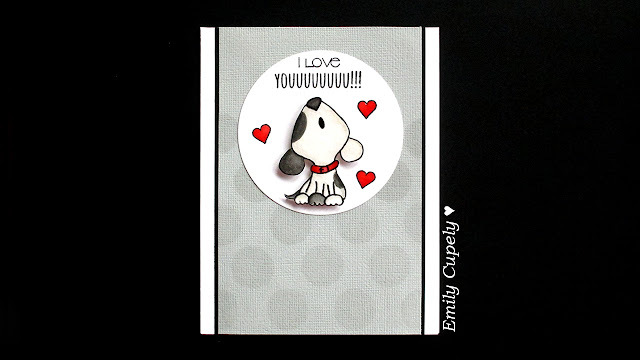 For my card, I started off by stamping the sentiment and bunny on to some white cardstock using black ink. I then masked off the bunny and stamped the balloon. I drew in the balloon string with a black pen and masked the balloon too. I added some cloud masks and then coloured in the sky using the Copic Airbrush system - I love the effect this gives, especially for sky's. I coloured the bunny, balloon and clouds with Copic Markers. 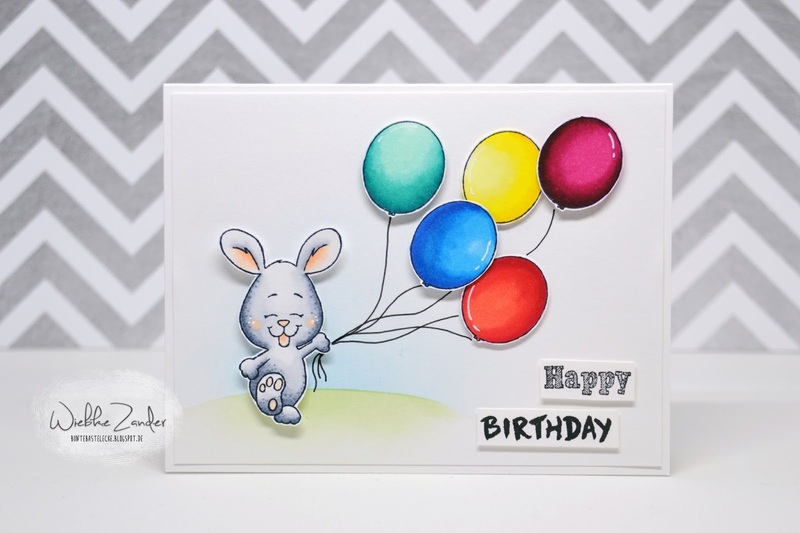 The panel was added to a white A2 card base and then I applied a coat of Wink of Stella and Glossy Accents to the balloon. I also added some Glossy Accents to the bunny's nose. I love this set, it is great for so many occasions. I will be back later in the month with another guest spot but until then, thank you for visiting the blog today. Have a great day! Hello crafty friends! It's Jess from JessCrafts.com. Today I'm sharing a simple birthday card featuring the new Howl Are You? stamp set. I love all these cute puppies but you can mix it with some other sets to make them perfect for special occasions. This puppy looks like he is sniffing around for some birthday cake or maybe birthday bones. I stamped the bones in white pigment ink. You can find out a bit more about the card in the video below. As mentioned in the video I used Zig Clean Color pens for the coloring. They are great for fast coloring and you don't have to be a coloring expert to achieve great blends. I love seeing everyone's work in the Gerda Steiner Designs Facebook group and encourage you to join us and share but also join in on some challenges to win.